At the end of last month we took our team to the Dot All conference for Craft CMS Developers which took place in Berlin. The name Dot All is a reference to a technical function within Craft CMS, but importantly represents an inclusive community spirit that welcomes developers and end-users from all walks of life and any level of experience. Not only was the conference an amazing event with fantastic speakers, but once again we were bronze sponsors, supporting the event for the 2nd year running. A few days following our return from Berlin, we recorded a conversation between myself, our developer Matt and designer/front-end developer Laura as a podcast. We'll admit, the sound isn't great (it's our first podcasting experience), but listen in to hear about some of our favourite talks from Katie Fritz as she talks about Author Experience, Simon Vrachliotis on building "utility first" css, and how Craft can be used with Internet of Things (IoT) devices with Nicolas Le Guillou. We also chat about Brandon Kelly's keynote presentation talking about the "State of Craft", and what it means for the platform over the coming months (they've already ticked off launching the new Craft CMS website this week). We hope you enjoy the show. We're also hoping that this will be our first podcast of more to come of the following months, and once we've fine tuned our audio setup, we'll post more details here on our website. 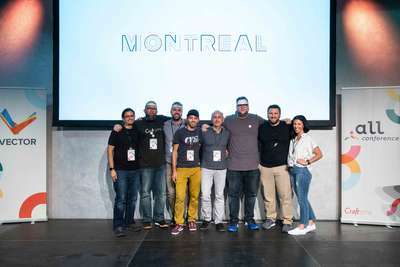 If you're thinking Dot All sounds like a great event to attend next year - you're absolutely right - and it takes place in Montreal! Here's a few video snippets from day 3 of the conference in Berlin. All images taken by Pixel & Tonic.